Arena Financing 100% Public Tax-exempt bond issue. While Nassau Veterans Memorial Coliseum has its structural and acoustical problems, going to an Islanders game can still be fun. Especially when the Rangers are in the house. There's usually an even mix of fans from both teams, so the back-and-forth discourse in the stands can be a thrill. But the building is showing its age (it opened in 1972). Many of the seats have obstructions, and the PA system has been compared to a clock radio. The color scheme makes the place look darker than it is. The team has talked about requesting renovations. Within hours after filing a lawsuit claiming the Nassau Coliseum is unsafe, the NHL New York Islanders moved out of the arena and into offices in Manhattan. Possible temporary homes include Madison Square Garden, Continental Airlines Arena, the First Union Spectrum in Philadelphia and the Civic Center in Hartford, CT. The NHL is helping the team in its search for a venue and is hiring its own engineers to inspect the arena. The first regular season home game is October 10, 1998. Team officials indicated they could play in several of the venues. The lawsuit says SMG, the company managing the venue, failed to make necessary improvements and that made the venue unsafe. As a result, the team says it was forced to evict itself from the arena. The Islanders hired an outside consultant to inspect the arena. Among the Islanders' complaints is the main scoreboard hoist system which the team says is a safety risk. The suit says SMG has not responded to requests that it be fixed or replaced. Other issues concern the elevators, roof, rink boards and glass and seats. The suit also says the bathrooms were in such poor shape last season that the team had to bring in portable toilets. The suit asks for the team to be released from its lease and for $10 million in damages. SMG officials say the safety issues are a smoke screen and that the move is simply a publicity stunt to get out of its lease. Engineers hired by SMG to inspect the arena found no problems, the company says. SMG officials also say they may file suit against the team if it plays outside the arena. Both sides are scheduled to meet today (Thursday) to discuss the situation. Reports also say that Howard Milstein is considering selling his share of the team because of the conflict with SMG and the arena. Milstein and Gluckstern bought the team earlier this year and said at the time that they hoped to build a new venue. The two have also reportedly reached an impasse in negotiations with the county for a new venue. The county has proposed a $270 million plan that calls for a new arena and retail complex to be built with the cost shared equally among the county, state and team. The New York Post says the team is not willing to invest more than $70 million. Meanwhile, the Islanders have hired architect Peter Eisenman to design a new arena. Eisenman is also working on a stadium proposal for the Arizona Cardinals and the University of Arkansas. His design for the University drew critical praise in Sunday's New York Times, but some local residents have been put off by its futuristic design. 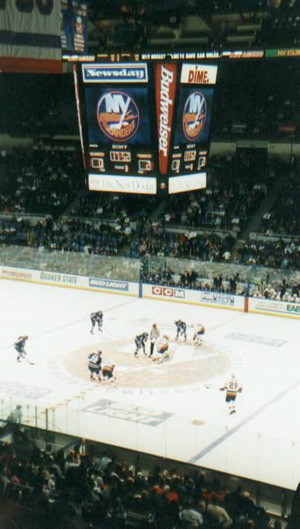 September 30, 1998 - (Associated Press) The New York Islanders were ordered to play their home games in Nassau Coliseum after a judge ruled the arena was safe to play in. State Supreme Court Judge Burton Joseph granted Nassau County's request for a preliminary injunction preventing the team from playing home games at any location other than the Coliseum. The team moved out of the arena earlier this month and filed a $10 million federal lawsuit against SMG, which leases the arena from the county, claiming the arena was a danger to fans and players. The Coliseum is home to not only the Islanders but the New York Saints indoor lacrosse team and many other sports and entertainment events. 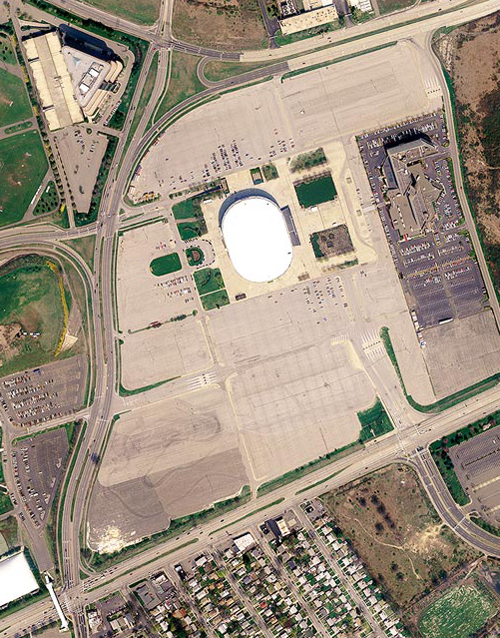 Adjacent to the arena is a 60,000 square foot Exhibition Hall for trade shows, consumer shows and conventions. From northern New York state, take I-95 to Throgs Neck Expressway; cross Throgs Neck Bridge and go three miles to Long Island Expressway East (I-495); go about seven miles to exit 38; go south to exit 31A, then to exit M4. From Midtown Manhattan, Take the Long Island Expressway (495) East to Exit 38, Northern State Parkway. Take the NSP to Exit 31A, Meadowbrook Parkway South. Take the MP to Exit M4, Nassau Coliseum/Hempstead Turnpike. The Coliseum will be right in front of you. From the Throgs Neck Bridge, Take the Clearview Expressway to the Grand Central Parkway East, which turns into the Northern State Parkway. Then take the NSP to Exit 31A, Meadowbrook Parkway South, and follow the above directions from there. From Eastern Long Island (North Shore), Take theNorthern State Parkway West to Exit 31A, Meadowbrook Parkway South. Follow the above directions from there. From Eastern Long Island (South Shore), Take Sunrise Highway to Southern State Parkway to exit 22N, Meadowbrook Parkway North. Take Exit M4 and follow signs to the Coliseum. By train or bus, Take the Long Island Railroad from Manhattan's Penn Station to the Hempstead (L.I.) Train Station, then walk one block to the Hempstead Bus Terminal and take bus N70, N71 or N72. January 21, 1997 - It was Arbour Day in January. The Isles renamed the street in front of Nassau County Coliseum "Al Arbour Way" to honor the 24 years their former coach dedicated to the team in various capacities. "It's something very, very nice and I certainly appreciate the thoughtfulness of it. Hopefully, there are some Stanley Cups at the end of this road too." March 4, 2000 - The Nassau Coliseum is located on Long Island far away from the hustle and bustle of Times Square and Midtown Manhattan. 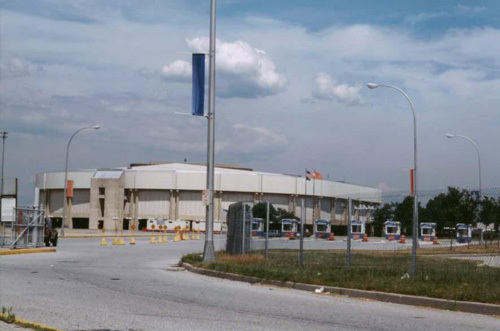 Built in 1972 near Hofstra University the building has served as home for the NHL New York Islanders since its opening and it is also home to the National Lacrosse League New York Saints and coming soon the AFL New York Dragons. Also in the past this venue was the site of the glory days of Dr. J and the ABA New York Nets. On this day the Sabres were in town so we took a peek inside to see one of hockey's most historic buildings. Once inside the arena doors we worked our way through a small main entrance to find a single concourse that encircles the arena. On the side away from the seating area itself there are ads interspersed with some of the great moments that occured during the Islanders history. One can also get a view of outside from the concourses as there is plenty of seethrough glass in which one can see, well the parking lot and not much else. Plenty of concession and small souvenir stands abound yet no main team store to be found here. While wandering around near the main entrance we spotted a staircase that took us down below that took us to some sort of exposition hall. There wasn't much to see here but they did have some sort of hall of fame with great local athletes and entertainers. We entered the seating area to see a single level 15,000 seat arena with some suites above the bowl and scrolling ads and dot matrix boards as well. Our seats were 2/3rds of the way up from the floor and gave a great view of the ice. Of course a Jumbotron hangs over the center of the ice. For us however it was the banners that caught our eye. We looked in awe at the four Stanley Cup banners and the retired numbers of Bossy, Smith, Potvin and so on. Must make up for the decade or so of futilty they have had here. Also in a nice move The Coliseum has a banner to honor legendary Long Island music icon Billy Joel. Sing us a song, you're the Piano Man!!! Sad to say our Sabres went down to defeat that day to the lowly Isles by a 4-2 count and it wasn't that close. The Islanders had their annual Stick Day(Pete's hometown friends will get a kick out of that) promotion so there was a near sellout on hand for this one. We'd have to say that was probably the coolest souvenir giveaway we've seen anywhere thus far. This building wasn't bad at all or at least not the house of horrors we were hearing about from others. Still in today's world of pro sports you need a building with plenty of suites and loads of club seats to stay competitive and in this venue that is sorely lacking. We'll return whenever a new arena is built and hopefully by then those kids behind us will stop kicking the back of my seat. Uniondale, N.Y. - The New York Islanders' plan to play an exhibition game in Kansas City is raising speculation that the team may be testing the waters for a move. Representatives for team owner Charles Wang said there's no plan to move the team, which reportedly loses more than $20 million a year. Uniondale, N.Y. - Even if billionaire Charles Wang wanted to move his New York Islanders off Long Island anytime soon - as worried fans have speculated in recent weeks - it wouldn't be easy. That's because the hockey team's lease with Nassau County contains strong language that prohibits such a move - at least for six more years. The agreement says the Islanders can't play any home game during the regular season anywhere but the Nassau Coliseum, which is owned by the county, until 2015. And legal experts say the lease can't be broken by paying off the remaining years because the prohibition, written as part of the 1985 lease and upheld by a Nassau State Supreme Court justice in 1998, says the team's presence on Long Island is what's important. If the owner attempted to move the team, Nassau County Attorney Lorna Goodman said, he could be held in contempt and face the possibility of jail time, high fines and the payment of any damages incurred by the county. Wang has expressed frustration over the slow progress of getting a new arena and his Lighthouse redevelopment off the ground. His comments, coupled with the team's recent announcements that it will play an exhibition game in Kansas City, Mo., which is actively seeking a National Hockey League franchise, and hold a training camp in Saskatoon, Saskatchewan, have fueled concern over the team's Long Island future. If the Islanders were to contest the lease, Alfred Brophy, a University of North Carolina professor of commercial real estate law, said the county would win the case in court. "It's a more extreme lease than you typically see," Brophy said. "If I'm the New York Islanders, I'm not sure I would want to sign this lease. From their perspective, it's a bad lease. But just because it's bad, it doesn't mean you can get out of it." Uniondale, N.Y. - Hempstead Supervisor Kate Murray called on Nassau County to seek federal stimulus money to launch the renovation of the county-owned Coliseum, saying the project would create valuable jobs, stimulate the local economy and keep the Islanders here. The arena renovation is one piece of the mammoth Lighthouse project proposed by Charles Wang and Scott Rechler. Murray said launching the work now would give the area an immediate economic boost. The entire Lighthouse Project is projected to take 10 years to complete once it gains approval from the town, county and state. She said the work could begin soon because the renovation requires a less extensive state environmental review than the Lighthouse project. Nassau County Executive Thomas Suozzi concurred that the "idea of seeking federal money to move the project along might be a good one," but doesn't agree that it makes sense to renovate the Coliseum without approval of the rest of the Lighthouse project. Wang and Rechler have said it's not feasible to spend $400 million on the Coliseum without building revenue-producing businesses around it. They responded with a letter to Suozzi: "We are very concerned that the Supervisor's letter is . . . another way to create a political "puck" - moving this worthwhile project from political party to political party." The letter also said the developers need a decision on the Lighthouse project from the town and a lease for the 150 acres of county-owned land no later than October - the beginning of the next hockey season. 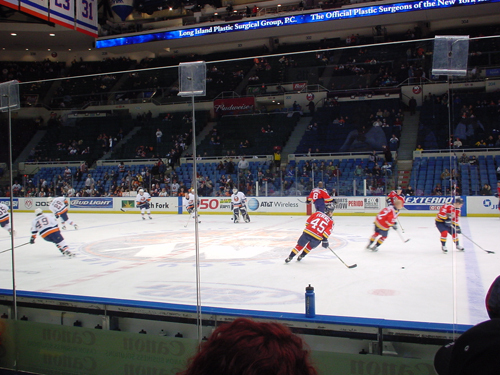 Charles Wang, owner of the New York Islanders, says the team will continue to play at Nassau Coliseum until 2015 when its lease expires, according to the New York Post. The team has been working to upgrade the venue as part of its Lighthouse development that is planned nearby. That project is still undergoing county review.